I took this trip on what I figured to be the last non-busy week before Spring Break; however, it was already getting crowded in the campsites (the Basin was full). I had arrived the night before around midnight; seeing that the other campsites were full I simply napped in the cab of my truck. It was fairly chilly, probably around 35-40, so I bundled up pretty well. I did see a coyote exploring the trash cans once early in the morning. 5.3 miles to Southeast Rim Trail jct. 8.0 miles to Colima trail jct. 8.8 miles to Blue Cr. trail jct. A bit after sunrise I went on into the Chisos Mountains to the Basin and the ranger HQ to get a backcountry permit. The nice older couple behind the counter, apparently camp hosts, pulled out a notebook with photos of the various campsites in the backcountry to help me to determine where I would go. Seeing the full campsite status, I was more concerned with getting away from crowds than a scenic site, but finally decided on Boot Canyon #4 and SW #3 just off the South Rim. I left the Basin trailhead, next to the ranger station, at about 9:00 a.m. As I followed the Pinnacles Trail (the more gradual, less direct route to the South Rim, but also more exposed to the sun is the alternative Laguna Meadows Trail) I noticed the relatively new additions to the Chisos Mountains Lodge, which are somewhat reminiscient of ski condominiums. As I ascended the Pinnacles Trail, I was passed by a handful of dayhikers but no overnighters. At about mile 3.0, the trail finishes the rather steep climb, then crosses the saddle between Emory Peak and Toll Mountain. After about 2:45, I reached the cut-off to the Emory Peak summit trail. Here there are bear boxes for hikers to stash their packs for their one-mile trip to the summit. Another mile brought me to the junction of the short trail which led to the designated Boot Canyon backcountry campsites. I went to the last one, BC4, which seemed to be the farthest away from the others. I was hoping for seclusion, and happily turned out to be the only person staying there that night. The sites at Boot Canyon are not particularly scenic, because after all they are in a canyon and the vistas are somewhat limited. There is plenty of good, level ground for sleeping sites, and bear boxes at each site to store your food. 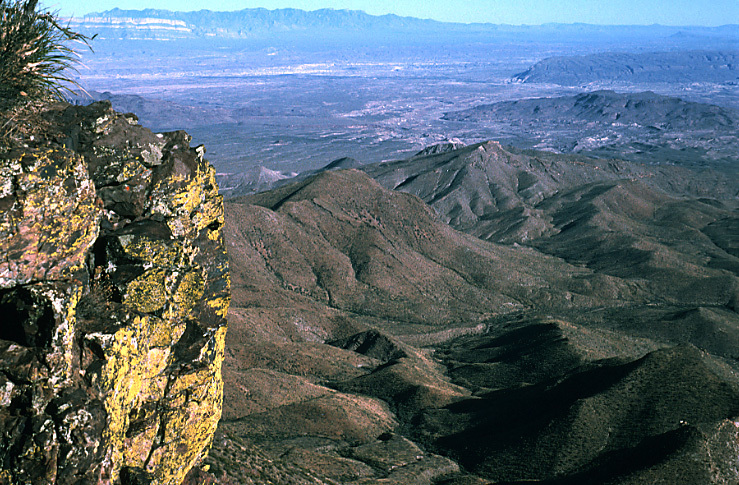 From this location one might explore on up the trail to Boot Spring, the nearby Colima trail (which connects the Pinnacles trail to the Laguna Meadow trail), or even go back to the Emory Peak summit trail. Even in winter there will be plenty of daylight if you've left the Basin early in the morning. 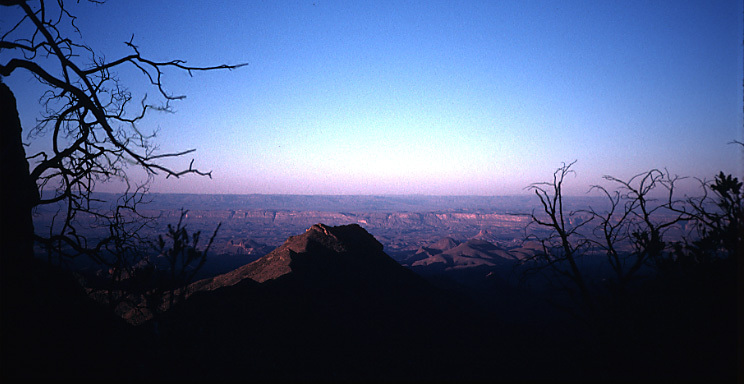 The next morning, moderately early, I took off for the South Rim. The trail continued to follow Boot Canyon (and passed Boot Spring), and other unnamed springs up the canyon. Do NOT rely on these for drinking. There was only a puddle in most places where there are sometimes pools when I was there. At 0.3 miles from Boot Canyon campsites, one passes the intersection with the Juniper Canyon trail, a trail I've never taken (yet) which allows the hiker to leave the Basin and reach the desert floor; this trail might be part of a longer, multi-day hike. One-half mile later, the trail splits with the Southeast Rim trail, a loop which adds an additional 2.3 miles to the hike, but one which is closed to both hikers and camping between 2/1 and 7/15. Just about ten minutes on further down the trail I took the detour to my campsite for that night, SW3, which is on the side of an unnamed peak (7395'). Nice views, more exposed and more breezy than my previous night's campsite. I left my pack there and brought my tripod and some other camera equipment back to the South Rim to take some pictures and wait for sunset, which did not disappoint. Met a few other hikers at the Rim. Later that night I slept under a spectacularly bright full moon; so bright, in fact, it kept me awake (I had no tent). I left early the next morning, passing SW2 after about ten minutes. (It's located down in a valley somewhat.) About a half-hour to the Colima Trail junction, another fifteen to the Blue Creek Trail cutoff, and shortly thereafter several Laguna Meadows campsites are located. Note that in the morning most of the trail to this point has been in the shade. It's roughly a couple more hours back down the trail to the Basin. It took me 2:35 to get from SW3 to the Basin. I noted with some relief a busload full of teens loudly packing up and starting up the Pinnacles trail, just as I was resting my feet at the trailhead. And note that although I was on the trail parts of three days, actual hiking time was substantially less, as I spent most of my time exploring, photographing, and goofing off. View to south and west returning from the rim.